Welcome to Rock On Charters. I am Capt. Marc Kerns, a U.S. Coast Guard approved Captain. As an experienced professional, I am always willing to teach guests how to improve their angling skills. Whether educating children or beginners, my approach is always patient and courteous. However, when guiding seasoned anglers, I understand catching is paramount, and I do everything possible to locate feeding fish. Over the years, many locals and vacationing anglers have agreed that Rock On’s fishing charters are satisfying, educational and always a memorable experience. Many, many years ago, I started fishing Tour level bass and striper tournaments up and down the East Coast from Jan. thru Dec., and it really made a huge improvement in my angling skills. By traveling all over and fishing different waters you quickly learn how to adapt and improvise to certain conditions when needed. I have taken those experiences and transferred them over to the saltwater world and have become very successful with them. I am always trying new and old techniques to improve fishing for the customer, as well as myself. I am a member of the ASA, FLW, SKA, BASS and other local organizations trying to stay on top of what is going on. As being part of the D.O.A. Pro staff and Berkley Fishing Pro Guide Staff, I fish with only the best equipment available. I believe fishing should be challenging as well as enjoyable; therefore, I use a lot of artificial lures instead of cut bait. 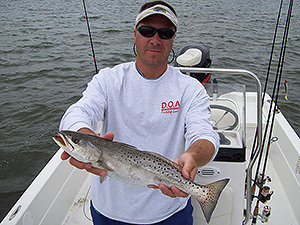 I feel using these techniques allows Rock On Charters to provide you with an exciting and memorable fishing experience. Thanks for looking at the site and I hope to fish with you soon.